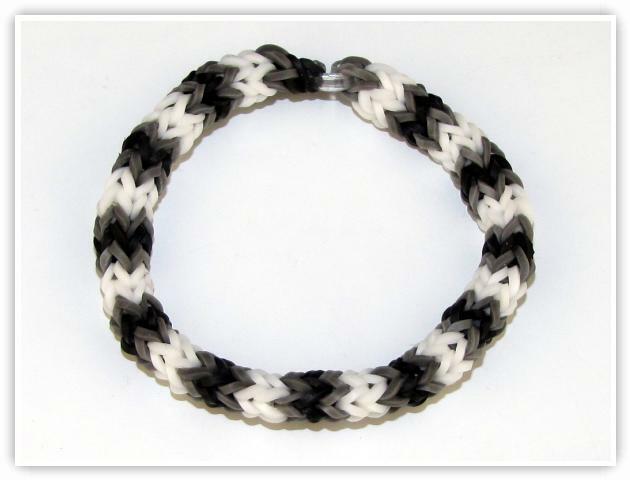 Description: This fishtail bracelet is made on 4 pins of the loom. You would need about 10 elastics per inch, and it can be made as long as you want. It is an Off-The-Loom pattern, so its pattern flows off the loom as more elastics are added. This pattern is a very fun pattern to make if you like sequenced patterns. Use your imagination when creating different sequences for this pattern. Check out our Tips and Tricks section to see various sequences of the 4 Pin Fishtail bracelet. 7) Attach the Clip to all strands of this elastic. The loom tool will help with this.